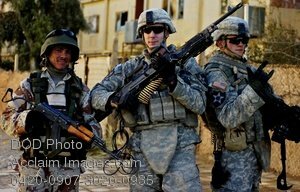 Description: Free, public domain image: Iraqi Soldier Posing with American Soldiers for a Picture. An Iraqi army soldier poses with Spc. 's Nicholas Muhar and Scott Coleman of Company C, 1st Battalion, 38th Infantry Regiment, 4th Stryker Brigade Comat Team, 2nd Infantry Divison, after clearing apartments in Mujema, Iraq, just north of Baqouba, Nov. 26.